For years, I was sure I didn’t need glasses. My sister, my mom, they wore glasses and eventually contacts, but not me. I got by fine in basketball, though baseball was pretty tough. In my classes, I learned to listen to the lecture to get the salient points down without having to read the board. Sure, I had to sit near the front in order to make out anything that went on an overhead projector, but this was generally misinterpreted by my teachers as good studiousness. As the years wore on, my vision got progressively worse and eventually I broke down and got a pair of glasses, at the insistence of the Indiana Bureau of Motor Vehicles. Even then, I only wore them in the car or in large lecture classes where the front seats were held by a clans of sorority girls from which I preferred to distance myself. While I found it handy to be able to see clearly, especially while operating a motor vehicle, there was always one aspect of the glasses which bugged me: the way they made people’s faces look. Without glasses, everyone had a soft roundedness to them that was flattering, comforting, and somewhat anonymizing. When I wore my glasses I was forced to see people clearly, with all their flaws and nuances on display, and quite frankly I preferred not to. Unbelievably, it wasn’t until this 2014th year anno domini, that I finally got a pair of glasses that I liked enough to wear around everyday. It promptly changed my life for the better, and I haven’t looked back since. This Sunday night, while taking the long walk from the restaurant to my car in the stinging sleet, I tucked my glasses into the inside breast pocket of my leather jacket, since the raindrops that clinging to their lenses made them useless anyhow. I was astounded by the world I had lived in for so long; the streetlights were smeared into their reflections on the pavement, cars drove by in a blur, and the faces of the few passersby looked stern and cold, if they bared any emotion at all. Once I reached my car I returned to the world of clarity and sped off. Through this One Week Without project, I feel that I am coming upon this same sense of clarity about my life and the way I interface with the world around me. Life had a certain element of blissful ignorance before, but I had no idea the world I was missing out on each and every day. 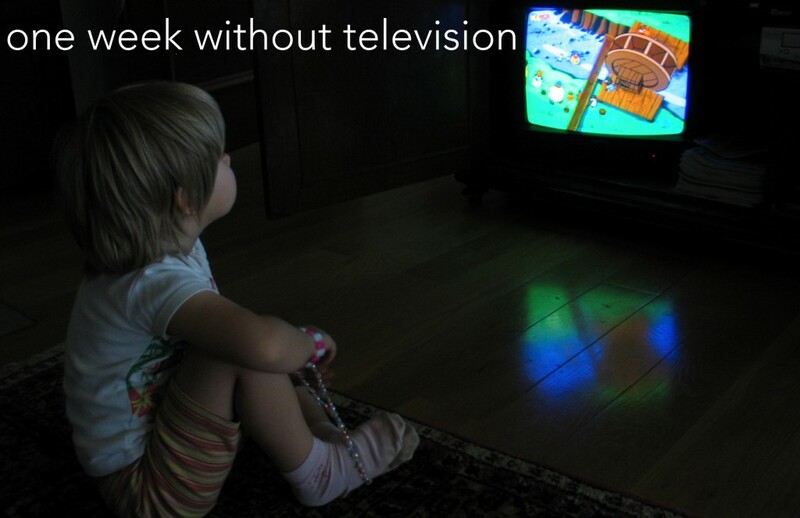 As of 2:20pm (CST) yesterday, I officially survived One Week Without Television. In general, when other people were around (which is fairly often when you live in a house with four roommates) it was easy, when I was alone or feeling sluggish it was a bit more difficult, but certainly doable. This week, more than anything, I became conscious of the amount of free time I have each day that I was completely unaware of—as I noted in my Midweek Update. For the most part, I was successfully able to fill this free time with active leisure, and without fail I felt worlds better at each activity’s end that I would have if I had simply sat on the couch and watched another hour of television. I had planned to do a simple article with a title something like “10 Things I Learned from One Week Without Television,” with sharable pictures and such, since that’s the kind of thing people seem to like to post on Facebook and Pinterest these days, and heck, maybe I will do that sort of thing at some point on other blogs, but my blog will try to abstain from that sort of link-baiting haberdashery. Ultimately, I don’t see the need to quit watching television and movies entirely, after all, One Week Without isn’t about missing out, it’s about living life to the fullest. Instead, I’m going to only watch movies and TV with other people, and not in excess or as habit. Having the occasional movie night with friends is a fun way to hangout without spending money, but lying in bed watching Netflix for hours on end is a waste of time and energy. The most unanticipated of all the lessons I learned this week was also the most powerful: I haven’t spent time really talking with someone in ages. I socialize plenty, but I rarely take the time to give someone my undivided attention and actually listen to what they have to say. Every time I had one of these conversations this week I was left feeling better about myself and my place in the world, not to mention I got a lot of great advice from some pretty smart people. If one habit most closely replaced television this past week it was fiction reading. I read a lot, but in the past few months I’ve mainly been reading nonfiction and informational material. Reading fiction has the ability to transform the way that you look at the world each moment, not to mention it’s a pretty good way to become a better thinker and writer. I found that the two best times to read were when I woke up in the morning and just before I went to bed, two times that had previously been set aside for television watching. Where TV tends to take me outside of myself, fiction reading takes me further inside and makes me question reality, not escape it. Tomorrow I will be starting my next challenge: going one week without any meat in my diet. Check back in tomorrow afternoon for more details, for now I’m going to enjoy one last Jalepeño Popper Burger, medium rare. Great way to wrap up the experience. Thanks for sharing! This if full of legitimate thoughts and observations. Things that i have been thinking about for some time now.Great job.